United Religions Initiative North America – URI North America promotes interfaith cooperation in the United States and Canada to support peace, justice and healing around the world. The United Religions Initiative (URI) is the world’s largest grassroots interfaith peacebuilding network with more than 900 members in over 100 countries worldwide. We cultivate and connect grassroots change-makers across religious, cultural and geographic boundaries, harnessing their collective power to take on religiously motivated violence and social, economic and environmental crises that destabilize regions and contribute to poverty. 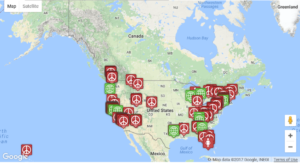 With more than 100 Cooperation Circle and Affiliate members from Hawaii to Maine and Vancouver to Florida, the United Religions Initiative in North America is improving communication and networking in the interfaith peacebuilding movement across Canada and the United States. URI North America is registered as a tax-exempt 501(c)3 charitable organization by the US Internal Revenue Service. Between 1996 and 2000, people from diverse religions, spiritual expressions, and Indigenous traditions worked together to create the URI Charter. The Preamble, Purpose, Principles (PPPs) of the URI Charter is the foundation of URI and it guides all actions within URI—both of individual members and the global organization. The URI Charter is the common thread connecting Cooperation Circles and Affiliates to create powerful coalitions for change at the local, regional, and global levels—across religious, political, and ethnic divisions. This shared set of principles provides people with diverse backgrounds a foundation to join together for positive change. To learn more about the URI charter or URI’s history, click here. At the heart of URI is a global network of locally organized Cooperation Circles (CCs). Each CC is a local or virtual group that includes at least 7 members representing at least 3 different religions, spiritual paths or indigenous traditions. CCs engage people of different faiths and traditions to work together for the good of their communities, in accordance with the Preamble, Purpose and Principles of URI. These self-directed, self-organizing and self-funded groups are supported and served by eight URI regions around the globe, of which North America is one. In North America, we also have an Affiliate Program for joining the URI network. Any individual, group, or organization who supports the URI Charter and its Purpose, Preamble and Principles may become an Affiliate. Whatever your ability to participate—please join with us. Check out these 5 simple ways of to get involved! Help the United Religions Initiative in North Ameria further its mission of supporting and fostering interfaith peacebuilding and social change by donating. We are a registered 501(c)(3) non-profit organization. Start your own Cooperation Circle or become an Affiliate. We are always looking for volunteers to work on our “wish list” of projects. Find out more about these opportunities. Read our blog or sign-up for our email newsletter to receive encouraging and inspiring updates and resources. Follow and spread the message of peace using social media! Follow URI North America on Facebook , Instagram, or Twitter. If you would like to talk with one of our staff or regional leadership members, please contact us. We are more than happy to answer any questions that you may have.